North of Syue Main Peak, along the famous "Holy Ridge". How to get there: See the description of Syue Mountain. Route description: The nicest route follows the famous "Holy Ridge" route starting from the summit of Syue Mountain. The "Holy Ridge" route is 15 km long and ends at the very characteristic, sharp peak named Dabajian. 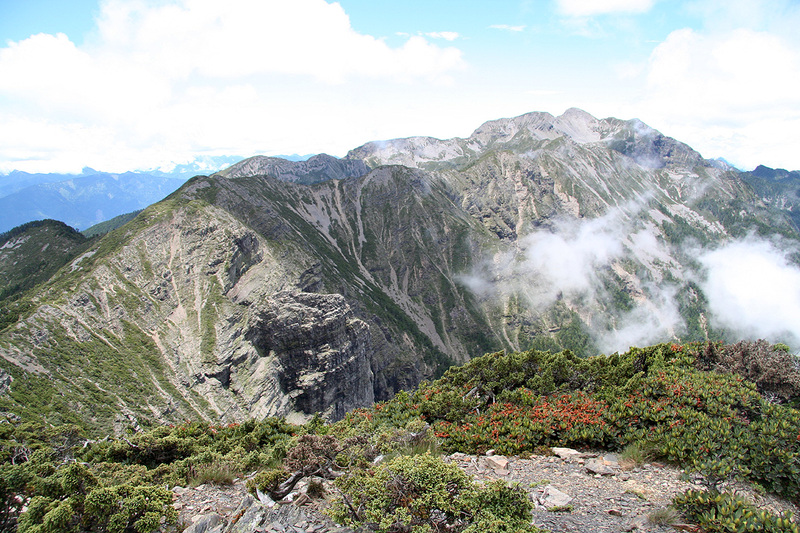 However, the first 4.5 km will get you from Syue Mountain to the North Peak of Syue Mountain, and serves as a good introduction to this route. From the main peak of Syue Mountain, first descend gently to the first col, location N24:23.159, E121:13.888, elevation about 3810 meter. 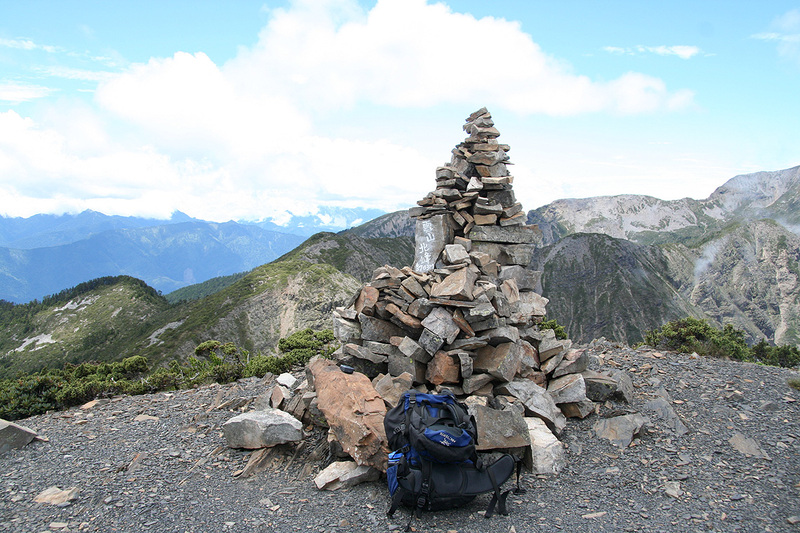 From here, scramble up to the summit of point 3880 meter, location N24:23.253, E121:13.864. The route runs up a broad gully, class 2+, then climbs a short, but easy section where the crux part is (YDS) class 3. From here to the North Summit the difficulty stays at (YDS) class 2 with the possible exception of a very short pitch that may be rated 2+. The route now traverses many small humps along the ridge. In one of the early cols, at location N24:23.839, E121:14.029, with elevation approximately 3680 m, there is a trail fork with one trail descending steeply to your right. This trail heads back to Lodge 369, by first descending partway down the scree gully, then traversing across the hillside as well as descending further among the trees. If coming from the Syue mountain, one may return along the ridge to this point, then taking this alternate route in order to not retrace the entire route back via the main Syue summit. This trail fork has signs, however the lodge is identified by a different name (not 369). Returning to the main ridge, after this trailfork the route traverses humps with elevations 3731 meter, 3705 meter, 3661 meter and 3659 meter all with lower saddles between them (as well as a few additional minor humps) before descending to the main saddle before the North Syue Summit. This final saddle is about 3585 meter (map interpolation) and is located near N24:24.696, E121.14.564. There is a (pretty large) A-frame shelter in this saddle, well protected among trees. From here, the trail ascends the Syue North Summit, shortly before the top, there is again a trail fork, the main Holy Ridge continues straight down the north ridge, while the very last section to the summit runs more west. Comments: I climbed this route solo. I was at the summit of Syue mountain already at 0855. Having a good rest there and fine views all around for photo, it was still too early to return directly to the trailhead. The summit had a separate description of the Holy Ridge and why the rather special name had been adopted. I looked along towards the very distinct North Summit and decided to at least start out in that direction. Thus, I headed down towards the first col around 0915 and made the North summit at 1120. After returning along most of the same ridge, I took an alternate trail back to the 369 Lodge, arriving there at 1355. Another 10 minute rest was called for before returning to the trailhead at 1555. A total trip of 11:20, this was an excellent way to complete my hiking in the Shei-Pa National Park. 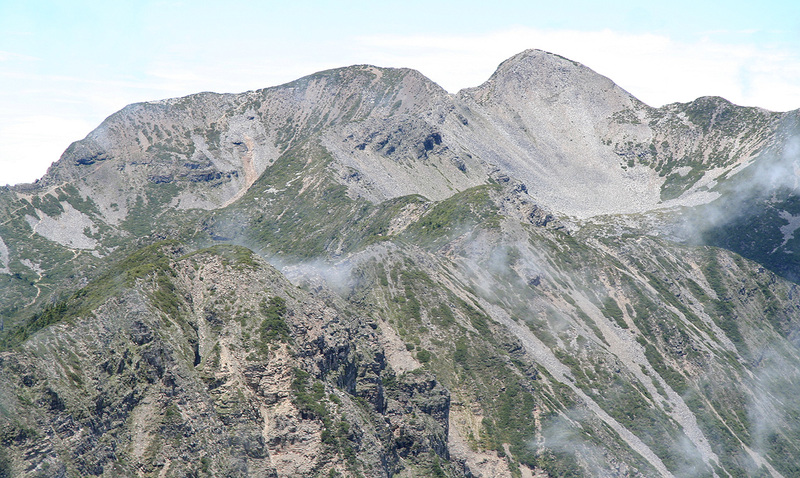 The Holy Ridge as it stretches back from the North Summit to the Syue Mountain, main peak. It is quite some way. Syue mountain (left) and the last part of the ridge connecting it to the North Summit.